This model is successfully regarded as the safest trampoline for kids thanks to a great number of safety features. Its sturdy frame is built up from strong reinforced T-sockets and 6 W legs, which play an important role in preventing structural twisting. The extra equipment of safety enclosure is a positive feature of the trampoline. It becomes extremely important to eliminate injuries from falling down of the trampoline mat. You could be rest assured about its stability from patented button-hole feature. The enclosure securely attaches to trampoline mat to prevent stuck fingers into the springs. Durability is another impressive feature of the tool, which enhances its longevity for years. Skywalker 12-Feet Round Trampoline equips high-quality materials such as galvanized rust resistant steels. 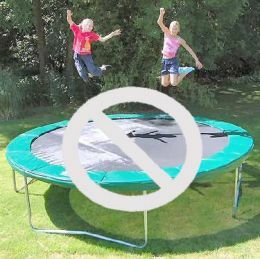 It helps the trampoline endure different weather conditions, for example, rainy days, snow, wind and more. When your kids grow a little bit, they often try to make higher bounces. That’s the reason why heavy duty mat could serve this function well. Your children could feel free to enjoy gorgeous features from this smart trampoline with high weight capacity up to 200 pounds. You had better allow only one kid at one time of jumping on the trampoline. Another typical trampoline for households with small kids, this is AirZone 12 Feet Spring Trampoline. The trampoline is highly rated by remarkable safety. It is recognized by ASTM certification for safety and durability. In addition to 4 W-shaped legs and steel frame, it also equips safety enclosure to protect young jumpers from falling down the trampoline mat. One fact is that the enclosure securely contacts to the jump mat to reduce injuries from touching any edge. Besides, there is no-weld T-Joint for setting up its construction and enhancing its stability. In comparison with other trampolines in the same size, this model makes people feel happy thanks to the great ease of assembling different parts. There is no additional tool required for setting up the trampoline establishment. Then, it takes you extremely short time to complete all necessary steps. The trampoline allows children above 6 years old and 200 pounds of weight limit. Last but not least, Springfree 10ft Trampoline features top high-end characteristics of a modern spring-less trampoline. Differentiating from other traditional trampolines, this model doesn’t equip dangerous springs which can stick small fingers. It comes with durable fiberglass mat rods. This helps eliminate injuries on joints and legs when jumping on the trampoline mat. Combining well with the enclosure, it protects people from falling down the trampoline surface. Moreover, other parts of the machine work well with each other in boosting its durability over time. The combination between galvanized steel frames and UV resistant polypropylene comprehensively increases high usability under different weather conditions. Being considered as the safest trampoline in the world, the tool allows both adult and children to jump on the mat at one time. It could endure the weight capacity up to 250 pounds and 1100 pounds of structural load capacity. Wow, how amazing the trampoline is! A great benefit of using the trampoline is its additional equipment of supportive accessories. FlexrrHoop serves the demands of playing basketball. Furthermore, FlexrStep makes coming in and out the trampoline much easier than ever before. Get the product now and enjoy all of its fantastic features! In conclusion, safety is the most important factor that we should concern before purchasing a trampoline. Among top 3 safest trampolines above, Springfree 10ft Trampoline Medium Round is considered to be the most expensive model thanks to numerous gorgeous characteristics. It requires you to consider carefully making right investment. What is Trampoline Basketball Hoop & Goal?